Warm Bodies is my first zombie book. 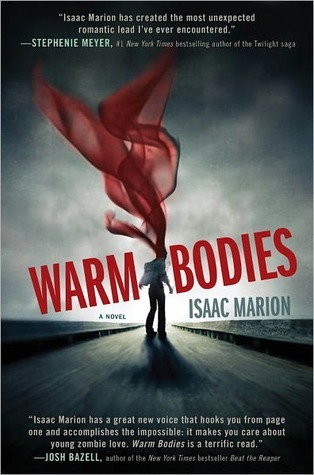 If you're a fan of zombie books, Warm Bodies is definitely something to pick up. If you're not a fan of zombie books, don't pass this by. While the book doesn't skimp on the violence of zombie appetites, its most prominent features are beautiful prose, thought provoking philosophical questions, and a subtle, sweet love story. Our hero, R, is a zombie. He can't remember how long he's been a zombie, what he did as a human, or even his name (aside from his first initial). He is more verbal and self-aware than most other zombies, but he still spends his life in a trance. He lives with a large group of zombies in an abandoned airport. They try to recreate their human lives to some degree. There are schools for children, churches, marriages, etc. The zombies really don't understand what they're doing, but some subconscious part of their mind craves the structure of a human life. Some zombies are not verbal at all while others like R can speak in halting, simple sentences. They spend most of their time groaning and shrugging. There's plenty of death in Warm Bodies. R describes in great detail hunting humans and devouring their brains. Zombies don't need to eat brains, but they're drawn to them. When they consume a brain, they relive the person's life and memories - the zombies get to be alive for a short time. It's addicting. R goes on a hunting run and eats a teenaged boy name Perry. Perry's memories are particularly strong and become all consuming for R. He instinctively saves Julie from the other zombies and takes her back to his home at the zombies' airport. Julie definitely does not fall instantly in love with R. She fears him, for one thing, but mostly she's angry. Julie has had a hard life. Her mother died when she was fairly young and her general father thinks only of security and fighting. Julie is hardened and quick to lash out. R is almost the exact opposite. Extremely patient. Protective. Slow to anger. While he basically holds Julie hostage, they form a reluctant friendship and then a stronger attachment. Their relationship is sweet. I love how R calmed Julie down and helped heal her in a way, while Julie showed R how to be more than a shrugging, groaning zombie. I start to shrug and then stop myself, with some difficulty. How can I possibly explain this to her in words? The slow death of Quixote. The abandoning of quests, the surrendering of desires, the settling in and settling down that is the inevitable fate of the Dead. The book is worth reading for no other reason than a philosophical exercise. My main problem with this book is that so many things are not explained well. The zombie lifestyle is explained thoroughly and clearly. That was fascinating. What was lacking was the explanation of why the zombies existed in the first place. It says that there was some kind of curse, but it was basically left at that. Highly incomplete. Also, why are there so few humans? Is it just because the zombies have killed them or have they killed each other? How long has this been going on? The book indicates that things have gotten really bad in the last few years, but it also implies that zombies have been around for at least 50 or 60 years. I think the book would have benefited from a few pages of background slipped in throughout the story. Despite a few world-building flaws, Warm Bodies is a lovely, thoughtful story. It is ultimately a romance between two unlikely beings, but it is also a book to read when you are in the mood to stop and think about the greater things in life. I haven't read any zombie books, so I have no idea what to expect of them.But I loved your review enough to add it to my TBR pile. The cover page is really attractive. Especially the cloudy background. Zombies! I love them! Adding this book to me tbr. Thanks for the review! I'm a fan of zombie books and in recent years have noticed a lot of them brush over the actual reason as to how the zombies came about. I guess most scenarios for people becoming zombies have been played out numerous times and so they concentrate on other aspects of the story. This one sounds like it could be decent. Will have to scope it out and see if I like it. Zombies!!! Yay! I want to read this one soooo freaking bad I can taste it! I have never read a Zombie book before but I have heard that this one would be a good one to start with! First of all, you used the word "pontificate" which is awesome:) Second, I'm loving the sound of this book! Zombie's aren't usually my thing, but the characters sound too interesting in this one to let that keep me from reading. Definitely adding this one to my list! I'm intrigued, especially with the human aspect of the novel despite it being a zombie book. I can forgive some minor flaws when I'm sucked into the story. Going to put this one on my tbr pile. Thanks for the review, Alison! Well color me convinced! What a thoughtful and intriguing review. When you said R spoke in stilted language I got concerned but the quote really helped clarify the philosophical and linguistic elements. This is going to be a top pick for post-school enjoyment! I've never read a zombie book before but this one definitely sounds interesting! I mean, the plot sounds unique in the sense that the protagonist is the zombie which I've never heard of before. I've also never heard of a zombie that was capable of speech. Sounds a bit like Dust, which I read last summer so I'm vague on the details, but the Zombies lived in a sort of community and watched out for each other. I'd give this one a try. That snippet you shared is kind of heartbreaking. I'm a zombie fan after reading The Forest of Hands and Teeth. I'm reading Graveminder now. It's a different kind of zombie book...not like Warm Bodies. But I've been dying (no pun intended) to read Warm Bodies! This sounds fab! Except for maybe the part about eating brains in detail. LOL Great review! I'm not really all that keen on zombies, but this book sounds like it might be worth a try.